Any judicial reappraisal of the genocide perpetrated on the Sinti and Roma during the first few decades following the war was rudimentary at best. In those rare instances where convictions were pronounced, the judgements were nearly always lenient. 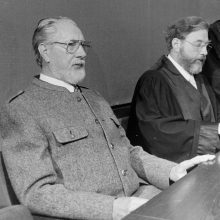 At the Nuremberg Trials (1945 to 1949) and the Frankfurt Auschwitz Trials (1963 to 1965), the crimes committed against the Sinti and Roma received only marginal attention, even though survivors of this particular group of victims testified as witnesses at both these trials. 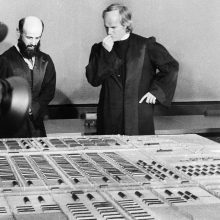 The genocide perpetrated against the Sinti and Roma only became the focal point of legal proceedings with the trial against Ernst August König, a former SS overseer at the Auschwitz-Birkenau ‘gypsy camp’. 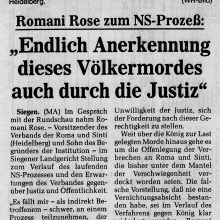 The trial began in May 1985 before the Siegen district court following an investigation petition filed by the Central Council of German Sinti and Roma. 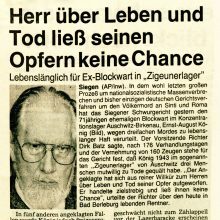 On 24 January 1991 the court sentenced König to life imprisonment for three proven murders. 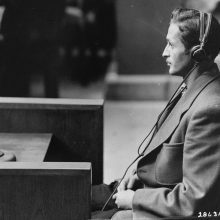 But even before the court decision had acquired legal force, König had taken his own life in his cell.